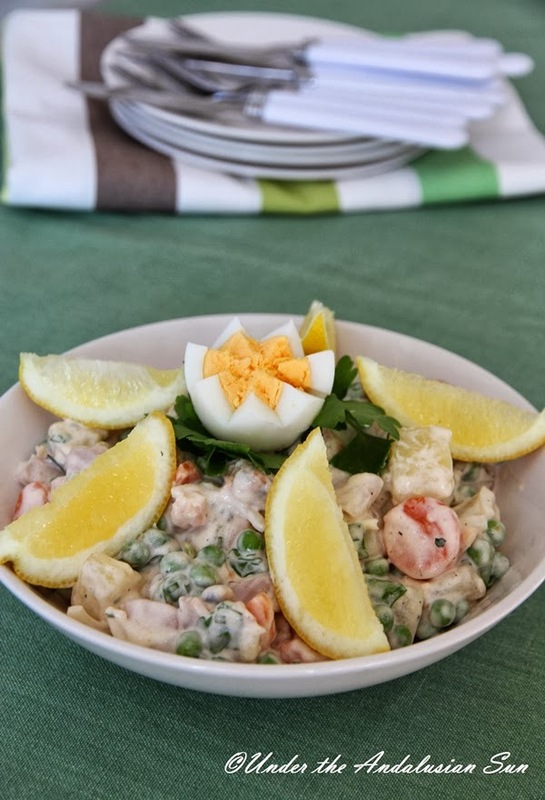 This Spanish take on potato salad is one of the most popular and wide-spread tapas dishes and was available in huge vats in that tapas restaurant in Marbella yesterday. There isn't really anything particularly Spanish about this dish, including the name. The direct translation for this is Russian salad, result of the liberal use of mayonnaise. As far as ingredients go, this is very fuss-free. Potatos, carrots, peas and that mayonnaise. Usually this is served with (tinned) tuna, but since everything can be made better, I used one of those seafood mix- bags available in most supermarket freezers. Naturally you can substitute it with same quantity of fresh seafood (king prawns, mussels, calamari...) if you can get your hands on some. As a tapa this is enough for 8, as lunch (with some green salad) this is enough for 3-5. If you want, you can replace some of the mayonnaise with Turkish yoghurt. I didn't. See, I've discovered a novel approach to the whole "get into bikini shape"- panic: I'll become a nudist! Let the seafood thaw. Peel the potatos and carrots and cut into cubes the size of your choice. Boil until done in salted water. Drain and carefully toss together with peas and finely sliced/ chopped onion. This way the heat of the potatos and carrots will help cook and soften the onions and peas too. Mix with the seafood. Mix the dressing and fold into the salad. Serve with hard-boiled eggs.